When most people think of vitamin C, oranges immediately come to mind. While a medium-sized orange does contain a lot of vitamin C (about 70 mg), there are many foods that actually contain more vitamin C than an orange. Vitamin C is vital for proper functioning. This vitamin is essential for proper immune function, wound healing, connective tissue formation, blood vessel formation, bone development, and free radical absorption. Did you also know that we cannot produce vitamin C or store vitamin C? That means we need a continual supply of this vital nutrient from our diet. The average recommended daily intake of vitamin C is between 75 and 120 milligrams (mg) per day—and you can only do this by eating a diet rich in vitamin C.
In order to reap the benefits of this essential vitamin, make sure you’re getting enough of it from your diet. Chilies, especially the green ones, contain 182 mg of vitamin C per every half cup serving; red chilies contain approximately 108 mg of vitamin C per half cup serving. A single green chili contains almost 110 mg of vitamin C! Try adding this amazing food to your next meal, as it will add flavor, texture, and, of course, vitamin C.
Guava is a tropical fruit which contains generous amounts of vitamin C, and it has a very rich and wonderful taste. The average serving of this fruit yields 380 mg of vitamin C per cup serving. Each average guava fruit contains approximately 125 mg of vitamin C. This fruit is great as part of a fruit salad and can add a significant amount of nutrients to your diet. Try eating at least one serving of mixed fruit salad daily. This is one of my favorite vegetables, because it has great color and sweetness, and it can be eaten raw or grilled. Red, yellow, and orange sweet bell peppers contain approximately 95 mg of vitamin C per half cup serving—yellow bell peppers can contain as much as 340 mg of vitamin C per pepper! I love grilling peppers or adding them to my favorite pizza or mixed vegetable salad. These herbs contain large amounts of vitamin C relative to their small size. A typical 100-gram serving of thyme can yield 160 mg of vitamin C, and parsley has about 130 mg of vitamin C per 100-gram serving. I recommend adding fresh thyme, parsley, and dill into your grain salad or garden salad on a regular basis. This will provide you with a fresher taste, and the added vitamin C is a bonus. This great tasting, sweet fruit from New Zealand is a very good source of vitamin C, beating out grapefruit, strawberries, Brussels sprouts, and broccoli. The average-sized kiwi contains 65 mg of vitamin C, which is quite a bit, given its rather small size. Kiwi is best served as part of a fruit salad or with yogurt and cottage cheese. It’s also great with cheese, grapes, or with hummus and pita for a snack! I recommend eating at least one kiwi per day for good health. 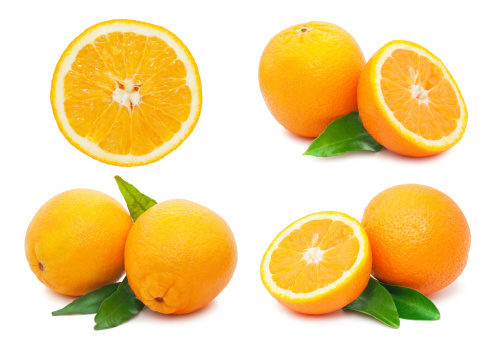 “Vitamin C,” National Institute of Health web site; http://ods.od.nih.gov/factsheets/VitaminC-HealthProfessional/, last accessed, June 24, 2013. “Vitamin C,” Health Alicious Ness web site; http://www.healthaliciousness.com/articles/vitamin-C.php, last accessed June 24, 2013.